What's the Temperature of Outer Space? 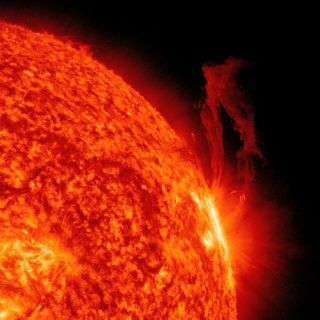 A close-up of one active region on the sun, seen in profile in extreme ultraviolet light, produced an interesting display of dynamic and frenetic sputtering over three days (Aug. 28-30, 2011). Some parts of space are hot! Gas between stars, as well as the solar wind, both seem to be what we call "empty space," yet they can be more than a thousand degrees, even millions of degrees. However, there's also what’s known as the cosmic background temperature, which is minus 455 degrees Fahrenheit. So what would a thermometer in space reveal? Somewhere between those extremes — depending on whether it's in the sun or the shade. Here's what’s going on: Most of the gas in space is too thin to warm anything up. Essentially, there are not enough gas particles to "bump" into and transfer heat to an object. So if you were in space, but shielded from the sun, you would radiate away nearly all your heat pretty quickly and cool to the cosmic background temperature. Step (or float) into the sun, and you’d be warmed. Either way you'd need lots of protection! At the Earth's distance from the sun, a space thermometer with roughly half its surface is absorbing sunlightwould register 45 degrees Fahrenheit. SpaceKids on SPACE.com provides simple, straightforward answers to really big cosmic questions. See more SpaceKids questions. You Can See the Moon Occult Saturn Thursday! Here's How.